They don’t make voices like Leela James‘ no mo’. She stands barely five-feet tall. But her voice is mammoth like her blowout hairdo. It’s also gritty, gospel-like and ferocious such as a 70’s soul singer. And southern like a plate of fried chicken, greens and hot sauce. 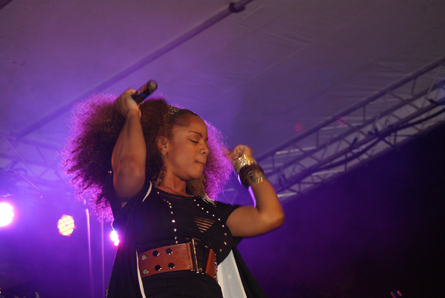 James headlined Dauphin County’s annual Cultural Fest in Harrisburg on Aug. 6. Groups 76 Degrees West and La Nueva Potencia opened up for James. James rocked black boots with a black outfit. The mesh section of her shirt revealed some cleavage. Her performance of “My Joy” was the most memorable. During that set, she walked off the stage and ventured into the audience so she could really connect with them. She wasn’t visible in the sea of people, but her soulful vocals reverberated throughout the downtown area. Other songs included her hit “Music” and The Staple Singers’ “I’ll Take You There.” James is lablemates on Stax with Lalah Hathaway, an artist who performed in Harrisburg on June 5. James also co-hosted BET’s My Black is Beautiful show. Did I mention that James’ impressive concert was free?!? Dauphin County commissioner George Hartwick III oversees the Cultural Fest. He told vigoronline.com that one of his goals as commissioner is to diversify this area with events such as the Cultural Fest. If you missed James’ concert, Click here to watch a performance she did for Walmart. See below for more concert pics. 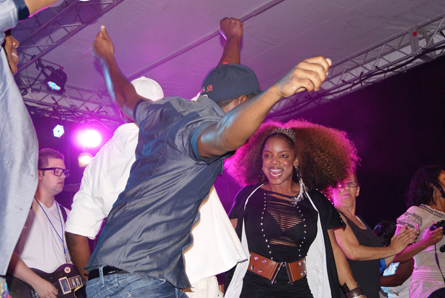 Leela James dances with fans on stage. Photo by Leon Laing. 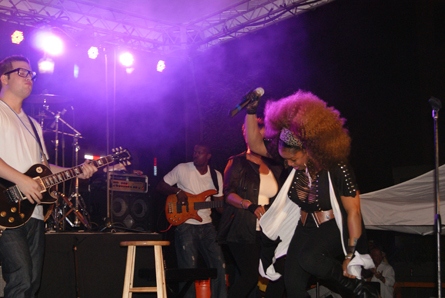 Leela James (right) pours her soul out on stage. Photo by Leon Laing. Hartwick jigs with James on stage. Photo by Leon Laing.